When applying for a job, telling the truth on personality tests isn’t necessary. Even though employers will say, “There are no right answers,” they use them to find the right employees. Therefore, one should look at them in the same light as interviews. They require research, prep, knowledge and skill. They’re quite passable. In response to this, testers say, “You might end up in a job you won’t like.” It assumes though these tests can tell that. Really? Prove it. They can’t. Not by science that is. Besides, the practicalities of the job search and fuzzy nature of personality tests just make this a scare tactic. Is there really a problem if you’re not telling the truth on personality tests to get a job? The job search’s practicalities don’t require telling the truth on personality tests. First, it’s almost impossible for employers to know if someone was not. Second, job seekers, for many reasons, apply for jobs they aren’t crazy about. Finally, employers aren’t gods. They might know the job better than the job seeker. They don’t know the job seeker better than the job seeker though. Getting to know a job is far easier than getting to know a person. The second reason, “You might end up in a job you won’t like,” is just a scare tactic, is the fuzzy nature of personality tests. That’s because science can’t prove they do what they say they do. For instance, in Paris, there is a block of metal under lock and key. It’s the standard for the kilogram for the entire world. No such hard-core standards exist for personality traits. Take the extrovert. No pure extrovert exists to measure this trait. That means experts must play with words and stats to make one up. Yes, those who sell personality tests will say their tests are proven, reliable and valid. They rely on stories and statistics to do this though. Neither is science. For instance, these reps will commonly say that clients had far more successful hires using the tests. Ask them to prove it wasn’t because employers expected their managers to coach the hires better because they spent so much on these tests. Then, ask them if a third-party ran this test. In it, some pass the personality test, some don’t. Yet, the employer is told that all passed. Then, see if there is a big difference shows up in performance. Now, that’s more in line with science. The practicalities of the job search and the fuzziness of personality tests, don’t make telling the truth on personality tests necessary. Plus, experts can’t tell for sure if one isn’t telling the truth. 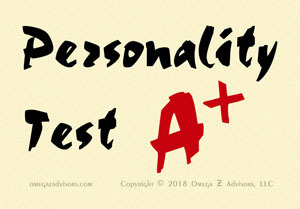 As long as one takes some simple precautions and never admit to not telling the truth, passing personality tests becomes very doable. It’s more doable than passing interviews. Note: For a more detailed look at personality tests and the industry around them, I recommend Annie Murphy Paul‘s book, The Cult of Personality Testing: How Personality Tests Are Leading Us to Miseducate Our Children, Mismanage Our Companies, and Misunderstand Ourselves.